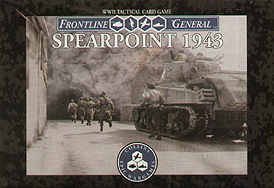 Frontline General: Spearpoint 1943 is a fast two-player tactical card wargame that focuses on WWII frontline combat, chaos, and tension. 100 Unit cards feature an assortment of historical German and US squad level infantry, artillery, armour, and aircraft. 50 Command cards give support and intel to players. 25 Damage cards apply unique Damage Effects. Combat is quick and tense and resolves using Four D10 dice. Standard and Situation games play in about 30 minutes including setup.